Once upon a time a demon called Taraka performed a long and difficult tapasya. Pleased with him, Brahma gave him the boon that only a son of Shiva could kill him. After getting this powerful boon, Taraka became very proud and selfish and started destroying heaven and earth. Seeing the chaos, the gods were in afix and requested Shiva to stop Taraka. At that time, Shiva did not have any sons. To create a son, Shiva took a form with six faces. Each face had a third eye. Six sparks came out of these eyes and formed into six babies. Parvati, wife of Shiva, was very happy and took all the babies in her arms to hug them. But she hugged them so tightly that the six babies turned into one baby with six heads. 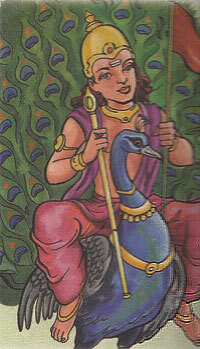 This baby was called Kartikeya was a strong boy and went with an army of goods to fight Taraka and killed him. Since then, Kartikeya is known as the god of war.